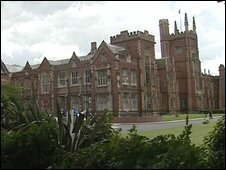 Queen's University Belfast has appointed a new chancellor. He is Kamalesh Sharma, the secretary general of the Commonwealth and former Indian high commissioner in London. Queen's says he was responsible for cementing relations between Northern Ireland and India which led to the country's investment in NI businesses. He will replace the American politician and diplomat Senator George Mitchell, who has just retired from the job as chancellor. The position is a largely honorary title and Mr Sharma said he was enormously proud to be given the job at Queen's.